Photo courtesy of Kai Lindfors. I rove you! Here is your lose. Ret me be youl Varentine!!! 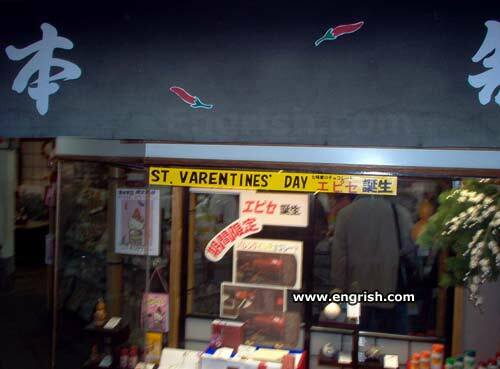 St Varentine’s Day is widely cereblated in Japan by giving your rove one cactus. St Varentines Day. That is when that rittle plick shoots allows into your healt. Haha @BFC. Cactus rike plegnancy. One plick is enough. And nothing rhymes with doggerel. Lomance is in the ail …..
We lost the handcuff key. For the rellies are due for a BBQ. Now finally it happens that she. On the very edge of the poolside deck. We drag the bed up the decking stair. And we rapidly release the handcuffs hasp. Why there is a bed and handcuffs in the pool water. Varentine… the patron saint of hopeless causes and Cubs fans. Arr you need is rove! Sulplise ! Speciar Derively ! Classic! and you don’t even have to look, you know it’s Japan. Well, they remembered he was a saint, anyway. More than you can get from most Western commercialization. Who is this St. Varentine? When is his day exactly? I have heard of St. Valentine but not him/her. Interesting. Rove is arr you need! You make rove rike a roman!